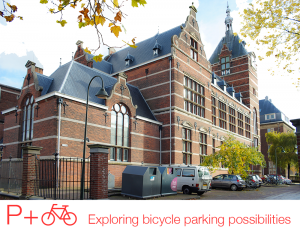 The DOB-Academy needs a solution for increasing numbers of parked bicycles around the monumental building in the city centre of Delft, the Netherlands. The DOB bicycle parking will help to promote bicycle use and to keep te surroundings free of randomly parked bikes. Bike-minded provided an analysis of possible scenario’s and how to integrate these with the beautiful monumental building. In the near future both employees and visitors will be welcomed with their bicycle by first class parking facilities.